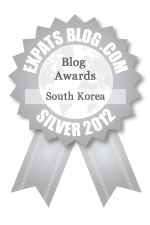 ExpatsBlog.com Expat Blog Awards 2012: Korea South Silver Award! This blog won the Silver Award for best expat blog in Korea South! The wonderfully kooky, wittily written and artfully presented brain-child of a sweet and straight-shootin' southern chick. A daily must. I am able to see thru the eyes of a young, wise, woman from the USA that lives and loves in South Korea. I will NEVER get to visit her or her favorite places...but I can "visit" through her exceptionally descriptive thought provoking written words and beautifully objective photographs. Who could ask for a better tourist guide? Great blog that is written with heart and positivity, hopefully one day I'll get to visit S.Korea ! I always get a little giddy when a new post from Whit shows up in my reader. She's such a positive lady, who's always amazed me with her ability to zero in on the beautiful moments of life. Her blog constantly makes me homesick for my past life in Korea! I truly love this blog - part whimsy, all honesty, and definitely eye candy. I enjoy having the opportunity to see South Korea through Whit's eyes and being taken along on her adventures and self discovery. I love how organized and well-written your blog is. =) I am actually really enjoying about all post you had, and I could get to know you better. I am inspired and accdited to your blog. your blog really deserves to read. Love this blog, cutest inspirational comments that make my mind tick and amazing tunes that keep me coming back. I have fallen in love with this whimsical blog. It always puts a smile on my face!! Lovely little blog. It has a nice aesthetic design and is full of the daily observations on the beauty of every day happenings in life. It's refreshing to see a blog about Korea that focuses on daily life for an expat, and not merely the travelling aspect of it. I love to read this blog because it puts a different perspective of Korea than most people see it. It's written well and I enjoy reading it. So refreshing to witness another part of the world through the eyes of a very unique and beautiful little bird! Miss you, W! A "whitty" blog I have been following since it's birth. Her daily observations are something truly refreshing, in society that can seem suffocating. I love seeing our world through her eyes. I love seeing and hearing another part of this world through Whitney's eyes and words. Her blog is thoughtful, witty, raw, and truly one of its kind. When I need a smile, I turn to this blog because through her highs and lows she always reminds you to remember the small things in life. A fantastic blog about adventures all over the world. Very well written with great photos and amazing tunes. Let's go Whit! Great blog- It speaks to my soul when I least expect it. Thanks Whit! Still bringing me blessings after all this time! Thank you for exposing yourself to the world in such an entertaining and Whitty way! I never regret spending time reading what you have to share. Keep it coming!! I must admit that I am not much of a blog follower/reader. It's difficult for a blog to pull me in and make me want to follow the updates. I keep up with 3 blogs total. Whit B Nimble is one of those blogs. I love seeing the world through Whit's eyes. She has a very youthful and refreshing spirit about her. I appreciate her for sharing her thoughts and ideas because often times I need to borrow a little bit of that spirit to make my day better. Whit B Nimble is the perfect little pick-me-up. I love Whitney's blog!She has a wonderful way of telling and sharing her experiences. I normally don't read a lot of personal blogs, but I love to read her posts, as there is always something heartwarming and special in it! :) Thanks Whitney!